The Langley Demonstration Garden is an educational facility operated in partnership with the Township of Langley. The Garden was established in 1992 to demonstrate sustainable gardening techniques. In 2013 it moved to a new permanent location inside the Derek Doubleday Arboretum. The garden is staffed weekdays May to August, and is open to the public year round. Please drop by to visit and explore! Preschools, day care and Strong Start groups are also invited to arrange free workshops in May and can find out more by visiting our Pre-K page. 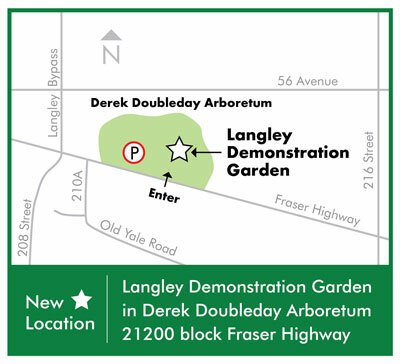 The Langley Demonstration Garden can be found in the Derek Doubleday Arboretum, on the north side of the 21200 block of Fraser Highway, between Old Yale Road and 216 St. Contact us at 604-546-0344 or email [email protected].